I've been amazing myself a bit recently. I currently have 5 empty bobbins. While lots of the spinning community would think "OMG! How could you not have projects on every single one of those?" Well, I've basically spent the last week or two cleaning off old projects on my wheel. I have felt very productive lately. Here are a few of the things I have to show. First I have a bit of a sample of yarn. 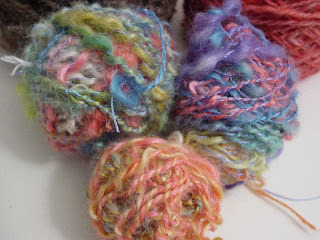 These were all spun from some mohair locks I was given. 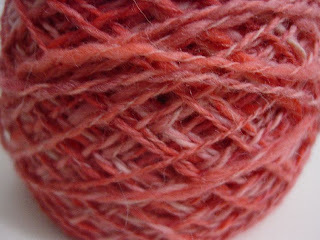 When I first started spinning the mohair I tried to make the yarn even and consistent. That was several months ago. Since this fiber was just sitting on the bobbin I decided to finish it. The next part was thick and thin slubby with curls. After the spinning I decided to do a two ply with some nylon thread. That worked out well for the slubby part (top left) but not so well on the more consistent strand (top right.) Since I was not happy with the 2 ply I cut the yarn and plied the remainder back on itself (bottom..) Its all a very interesting effect. 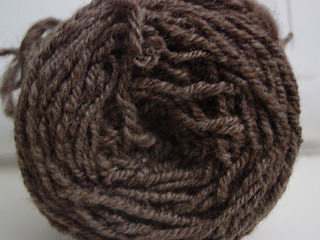 Should make a nice accent yarn. I will probably look into buying some mohair locks for any future textured yarns. Here is my most recent attempt at Navajo plying. I wasn't originally planning to do this but the idea was mentioned at the last spinning group. Here is a close up. I need to practice more but I think that it would make a great knit hat. 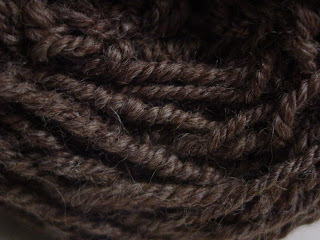 This last one is the final product of the previous yarn musings. I am quite impressed with the amount of variation. Its nice and not to overwhelming. I'm not quite sure what to do with this one. I thought about knitting and fulling some footies but I probably don't have that much yardage.